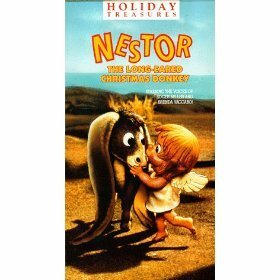 Nestor, The Long-Eared Christmas Donkey is a Christmas television special produced in stop motion animation by Rankin-Bass. It was first aired in 1977, and its' plot is similar to an earlier Rankin-Bass special, Rudolph the Red-Nosed Reindeer. This special currently airs on ABC Family annually. The Rudolph model as used in Rudolph's Shiny New Year is seen in the shot at the very end standing near the Christmas tree with the group of a few familiar characters. In addition, Jingle and Jangle (from The Year Without a Santa Claus), Mrs. Claus (as she is shown in The Year Without a Santa Claus), Santa, and other elves in the barn are there before Nestor says "Merry Christmas".